The folks at GMC have the media, and by extension those throngs who covet a hefty, 7- to 8-passenger crossover ute, somewhat excited at hints of a redesign for its 2015 Acadia lineup. Allegedly, a new chromed-up grille is on tap for the coming iteration, as are reworked front and rear fascia, LED daytime running lights, upgraded taillights and restyled wheels. Unfortunately, GM has no immediate plans to equip the 2015 Acadia lineup with its ballyhooed 4G LTE upgrade to the standard OnStar system. Nevertheless, it’s anticipated that this classy, yet family-oriented people hauler will remain available in 5 trims, the base SLE-1, the up-featured SLE-2, the midlevel SLT-1, the well-equipped SLT-2 and the flagship Denali. The standard front-wheel-drive (FWD) configuration stands pat and full-time all-wheel drive (AWD) will again be available in all trims for those who tackle snow-laden highways during their winter commute. Meanwhile, Jimmy has announced no plans to fiddle with the present Acadia dimensions, thus its impressive 116.1 cubic feet of cargo area (with all rear seats folded) is slated to return for 2015, though third-row denizens must again be on the small side to feel comfortable back there. Rumors are also leaking out of GM HQ that the redesigned Acadia, at least in its more upscale trim variations, will boast a number of upgrades to interior materials and fabrics, with corresponding improvements to several cabin features and creature comforts. One hopes, therefore, that the traditionally frustrating Intellilink touchscreen interface between Bluetooth communications, audio functions and the optional navigation system will be tweaked for at least marginally improved performance. In any case, as things stand, the entry-level SLE-1 offers standard seating for 8 passengers with its second- and third-row bench seats, as well as 18-inch alloy wheels, a roof rack and rear spoiler, and full power accessories. From there, depending on the trim selected, this full-size Jimmy crossover should again boast 19- and 20-inch chromed alloy wheels, premium cloth or leather upholstery, heated outside mirrors, cruise control and telescoping tilt-wheel steering. OnStar Directions and Connections technology is also slated to remain standard across the lineup, as is a rear-view camera and rear parking sensors. Front and rear air conditioning, meantime, return standard in lower trims, with tri-zone climate control delivered in upper-level editions. Further techno-bling in the higher Acadia iterations also should include a power liftgate, auto-dimming rear-view mirror, heated power-adjustable front seats, memory for driver's settings and a remote garage door opener, with the Denali adding a standard power sunroof. As for entertainment, both 2015 SLE trims are expected to again sport an Intellilink-interfaced single-CD player with 6 speakers and satellite radio, while the SLT-1 and -2, as well as the Denali, should return with a 10-speaker Bose premium system. Barring any significant changes and/or upgrades for 2015, meantime, look for lower Acadia trims to remain eligible for a number of optional features that come standard in the higher trims, with stuff like rear-seat DVD entertainment and hard-drive-based navigation available to all but the SLE-1. Additionally, a Technology Package flaunting a head-up windshield display, projector-beam headlights and rear cargo area audio controls will doubtless remain available to the SLT-2 and Denali iterations. There has been not a whiff of word regarding powertrains for the 2015 Acadia lineup, thus look for the ubiquitous 3.6-liter variable-valve-timed (VVT) V6 engine to return under the management of the competent 6-speed shiftable automatic transmission. Expect, once again, 288 hp and 270 lb-ft of torque from this peppy 6-banger, with towing maxed out at 5,200 pounds when toting the optional hitch and wiring, and mileage again estimated at 17 mpg city/24 highway in FWD-equipped versions and 16/23 in AWD-toting editions. Finally, with no definitive information regarding changes to standard safety features in the 2015 Acadia stable, look for 4-wheel antilock brakes (ABS), traction and stability control, front side-mounted airbags, and front and rear head airbags all to make a return engagement. A post-collision safety system, bolstered by OnStar emergency assistance and stolen vehicle tracking, is also expected to remain standard lineup-wide, as is a remote antitheft alarm. Additionally, expect the SLE-2 and higher trims to sport standard turn-signal-integrated mirrors, with the SLT-2 and the Denali also flaunting a standard blind-spot warning system, and the Denali ought to again add standard adaptive cruise control with forward-collision alert. Look for the 2015 Acadia to grace dealer showrooms in the summer of 2014. What's your take on the 2015 GMC Acadia? 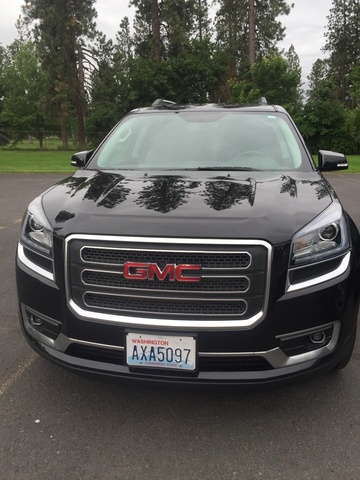 Users ranked 2015 GMC Acadia against other cars which they drove/owned. Each ranking was based on 9 categories. Here is the summary of top rankings. 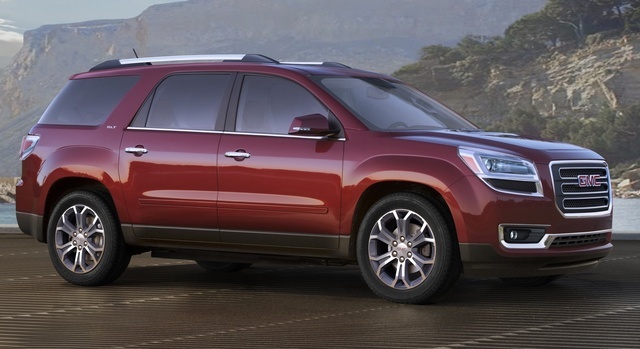 Have you driven a 2015 GMC Acadia? Can I switch out my 2015 Acadia rear captain seats with Bench seats? what does this mean when engine light is on?